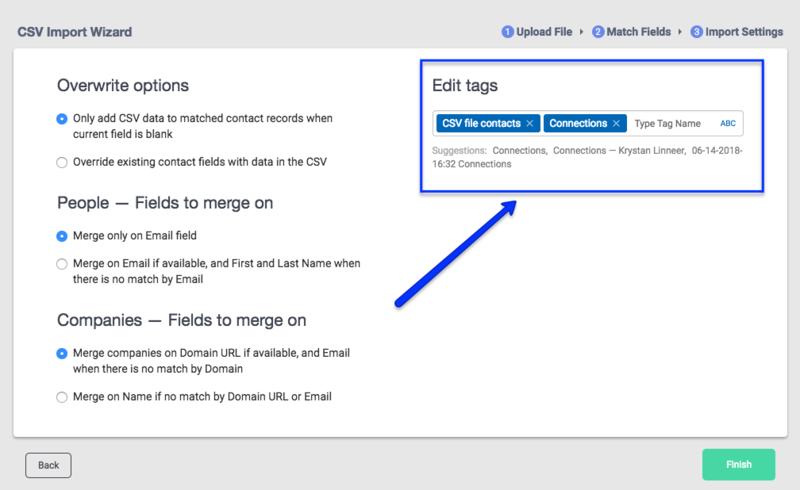 Learn how to organize contacts into lists via tags. 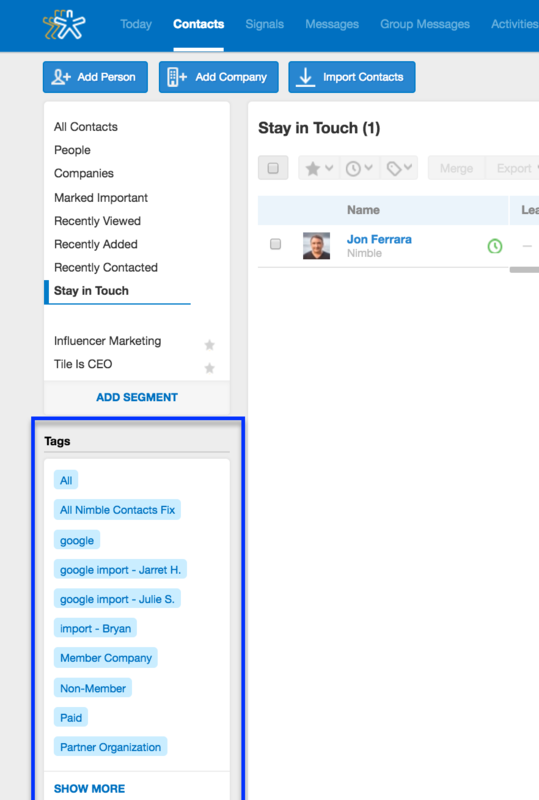 Tags in Nimble help you organize your contacts into different groups. Tags allow you to label, group, and identify your contacts and activities. How Do I Create Tags In My Contact List? How do I create tags on a contact record? Under the person/company name, select “Edit Tags"
You've successfully created a list with this tag. 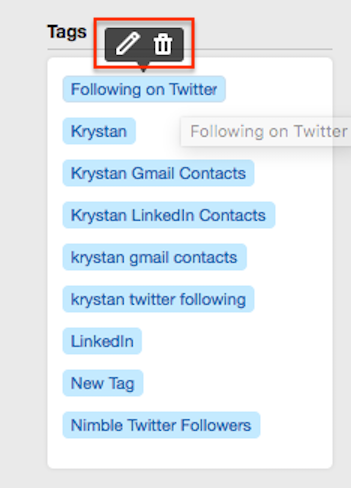 To add other contacts to this list, follow steps 1 & 2 above and then type in the tag's name you've created. Select the tag in the drop-down. It will automatically add the tag. To view all the contacts in this list, click on the tag. How do I manage tags for tasks? 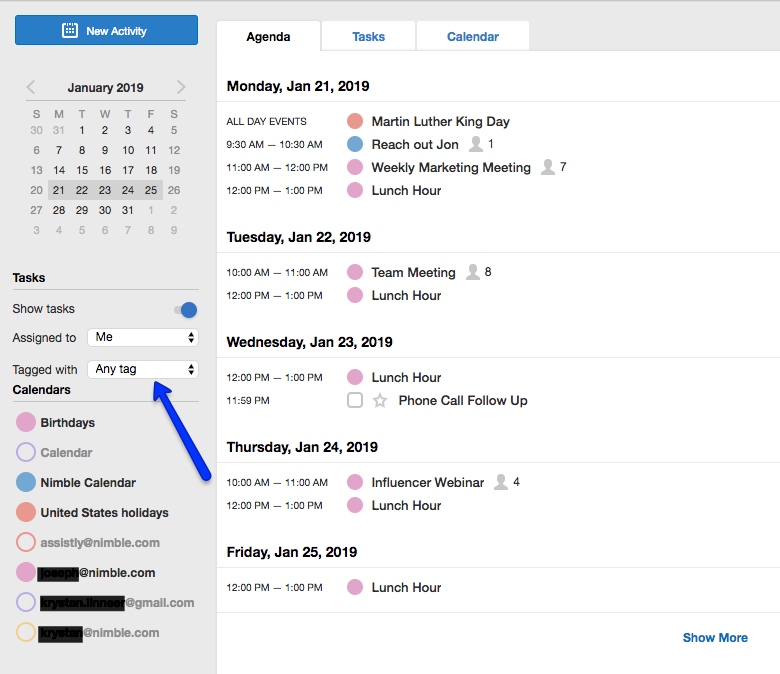 You can filter your Agenda page by tags using the drop-down menu on the left-hand side of the Activities tab. 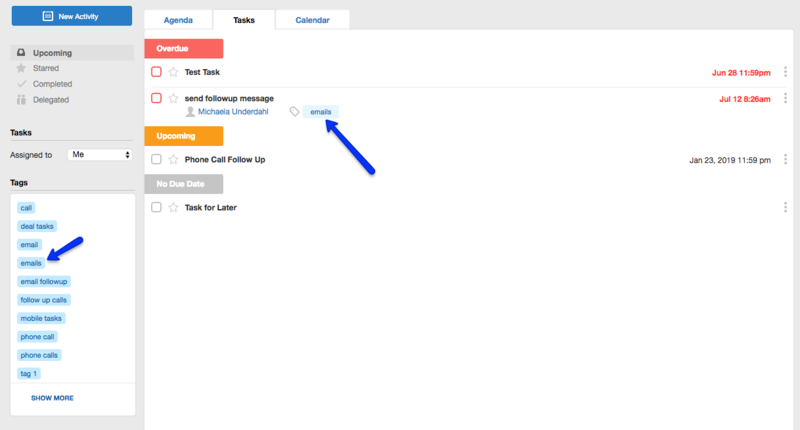 In the Tasks page of the Activities tab, tags for tasks you have created will appear in a cloud that looks similar to the one in the Contacts tab. How do I add tags during import? 1. Create tag columns and label them as Tag 1, Tag 2, etc. in your CSV file, then map the columns as tags using our CSV Import Wizard! 2. To apply one or more tags to all of the contacts in your CSV file, during Step 3 of our Import Wizard, you may enter as many tags as you like to the "Edit Tags" field! If you are applying more than one tag, be sure to separate them with commas. You can also click on any of the suggestions we provide based on the name of the file, your name, and the date, to automatically add them as tags for your import. 3. After connecting your Gmail, Twitter, or Foursquare account in Settings >> Networks & Imports, you’ll see the option to “Import Contacts.” You can group these contacts upon import to Nimble with a tag. How do I delete or rename a tag? Click Edit Tags and click on the X next to the tags you want to delete. In your Contacts tab, hover over the tag you want to delete or rename. Click on the pencil to rename it. Click on the trashcan to delete it.